When my friends and I turned 40, we made a point of finding joke cards about getting older for one another. I wasn’t a card-maker then, but if I had been, I would have made a card like this for the guys in our group. This card is for the new linky party theme, Fall'n for Flair, over at Paper Issues. 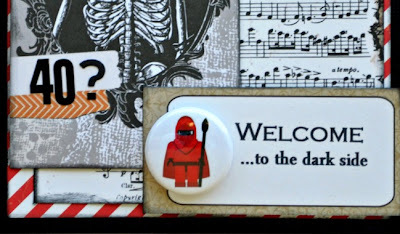 This super cute Star Wars inspired button is from Shelley Haganman’s etsy shop, A Flair For Buttons. If you love Fall and love flair, come join us over at Paper Issues. The linky party starts today for all your Fall and/or flair projects and runs through Oct. 6. To be entered in the drawing, please “like” the Facebook Page, A Flair For Buttons. Comments on the hop will be open for two weeks and two winners will be chosen by random draw and announced on Oct. 7 on the Paper Issues blog. You can find all your card-making and scrapbooking supplies over in the Paper Issues etsy shop, including October Afternoon's new Witch Hazel collection. And everything's on sale. Just use code IZZYB20 for 20 percent off your entire order. Cute card! Love these buttons! I can't get over how perfectly the Darth flair worked for this card. :) I love it! Definitely a great card for a newly minted 40 year old. That flair is perfect! What a fabulous card!! This is ADORABLE!!! I loveeeeeeeee the sentiment and the skeleton!!!! 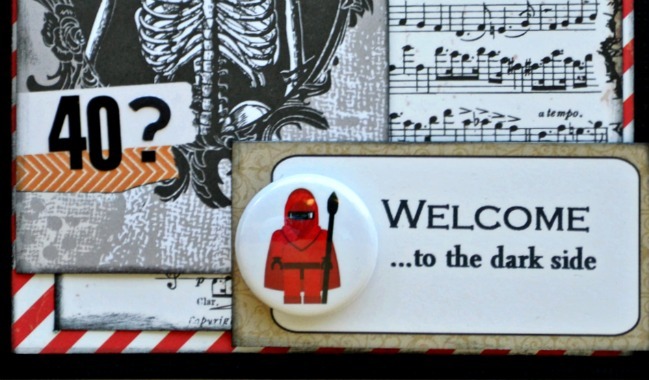 OMG, what a great way to use that skeleton and the star wars button, would never have thought to put them together!! love it!! oh my golly this is just way too cute!! hahaha what a great way to use Halloween product! Haha, I love it! Great way to use the Halloween stuff! This card, and the flair that goes with it made me chuckle! This is hilarious! But you are just a baby, really! Oh how awesome is this?! Love it!!! Ha ha ha! Love your sense of humor, Izzy! The dark side sentiment is HILARIOUS!! 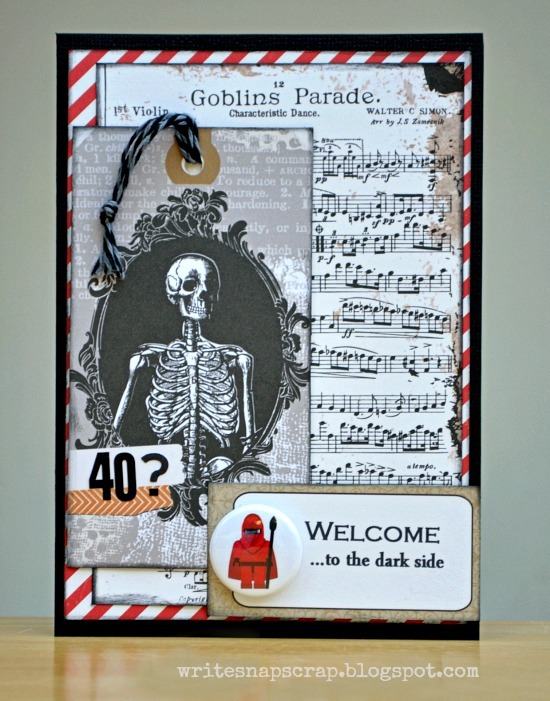 But if you have a skeleton on your cards for 40-yr-olds, then what do you put on cards for your friends turning 50??? coffins?? LOVE this fun card! The Lego flair is perfect. Like the whimsy birthday card. Oh my gosh Izzy! I am heading over to that flair shop right now. How cute is that?! I am over here giggling at your sentiment. What a Super Cute and Cool card! !